LinkedIn: Is it Necessary For High School & College Students? 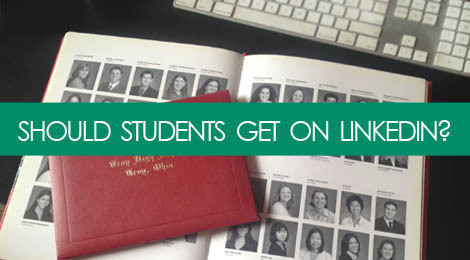 Do high school and college students need a LinkedIn Profile in order to apply to job and internship opportunities? The short answer is yes, as I remain in the thought camp that LinkedIn can benefit almost anyone. However, in this case, students of high school and college age are likely in a place where they’re thinking about their future career progression, and can be taking positive steps to build their professional reputation. In recent years, LinkedIn added college/university pages and reduced the minimum sign up age requirements from 18 to 14, with the intent of encouraging high school students to setup profiles and start following schools they may be interested in applying to. As such, LinkedIn is posing the thought that school admissions departments will start looking at these student LinkedIn profiles during the admissions process. In general, we know that social networks are at the top of the resource pile as recruiters’ and hiring managers’ go-to sourcing tools, with LinkedIn leading the pack. And many employers are looking for recent graduates, so having an active presence as a student can increase their visibility and help them connect with potential opportunities. Now a student’s strategy for putting together a LinkedIn profile will vary slightly from your typical full time professional, with a focus on showing off schoolwork, coursework, and extracurriculars. But some of the standards are still important, such as acquiring recommendations from professors, participating in the groups to engage with folks in their target industry, and build connections and relationships with industry leaders. Additionally, it’s a great way to explore future career options by educating oneself on what others in the industry have done, and what types of skill sets are in demand. Tags: entry-level professionals, internships, job search, LinkedIn, looking professional, networking, personal branding, professionalism. Bookmark the permalink. Should I Disclose Vacation Plans in the Job Interview? I am a high school student currently in my senior year. Upon signing up for LinkedIn I am required to fill in a “college/university” field, but I am not sure as to what I should fill this field with. Is it “unprofessional” to list my high school as my current education? I can not sign up without filling in this field.